RSVP to “Taste of the Christy” February 20th. RSVP for Our St. Paddy’s Dance Wednesday, March 13th. RSVP for Our Valentine’s Day Dinner & Dance Friday, February 15th. Have you made your Valentine’s Day plans yet? Don’t wait! 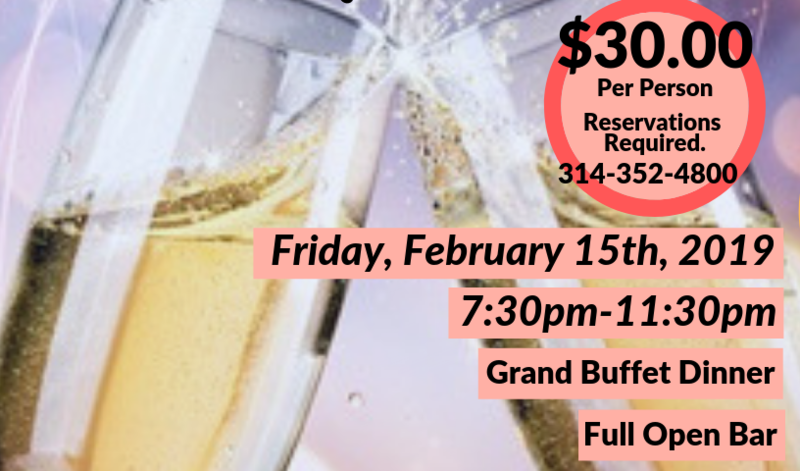 Join us for our Valentine’s Day Dinner & Dance at The Christy on Friday, February 15th, 2019. For only $30.00 per person, you’ll enjoy a grand buffet dinner, full open bar from 7:30PM-11:30PM, chocolate fountain, live D.J. and dancing! It’s perfect for a romantic date night or a fun night out with a group of friends! Seating is limited, call us today at 314-352-4800 for more information and to make your reservation.